With the exception of cutting up and measuring out all the veggies needed for this recipe, this was a quick and easy dish, something you could throw in a pot and forget about (well, at least for 15 minutes or so). This was much more flavorful than the last curry dish I made, with a nice rich curry sauce that had enough sweetness and tang at the same time, probably thanks to the added tomato paste. 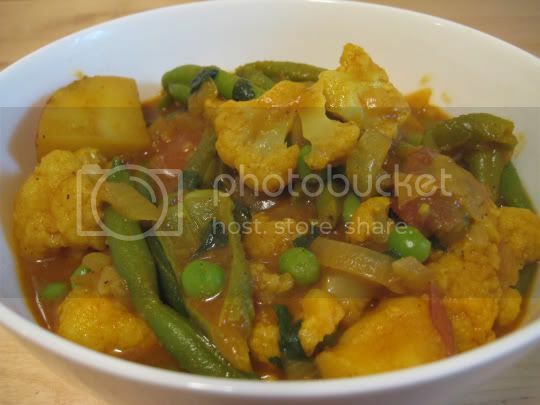 I also love peas in my curry, their buttery sweetness going so well with the spicy curry flavor. Still, there is something missing from both of these curries, and I can't quite put my finger on it. Let's just say they are non-Indian person curries (not trying to be offensive). If I ordered a curried veggie dish from an actual Indian restaurant, I imagine it would taste totally different and much more spice-y. Ah well, maybe I should just go get an Indian cookbook and see how that goes. Make again? Yes, good for leftovers...although it smelled up my fridge after I left the pot in there. Not a BAD smell...just very pungent.